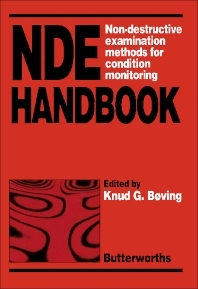 NDE Handbook: Non-Destructive Examination Methods for Condition Monitoring deals with monitoring of equipment, structures, and pipes in mechanical engineering, in the processing industry, in construction, and in electrotechnical fields. The book explains acoustic cross correlation involving leak detection in buried main water pipes or heating pipes by using special instruments to detect the flow noise generated at the point of fracture. The acoustic emission method, based on collection of vibrations or sound waves from the suspected material, can detect changes occurring in the material. Magnetic methods and eddy currents can measure the thickness of the coating on specific materials; dye penetrants can expose cracks or cleavages in surface materials; and emission spectroscopy can identify or sort the chemical composition of steel. The book also describes an endoscope used to visualize the interior of objects and the electrical resistance probe that can measure the loss of material based on changes in the electrical resistance. Other NDE methods that are used by investigators include stress pattern analysis by thermal emission, pulsed video thermography, Moire contour mapping, holographic interferometry, computerized tomography, and positron annihilation. The book will prove valuable for engineers, physicists, technicians, operators involved in material research, risk prevention, or accident control, and for general readers interested in materials quality and specifications.